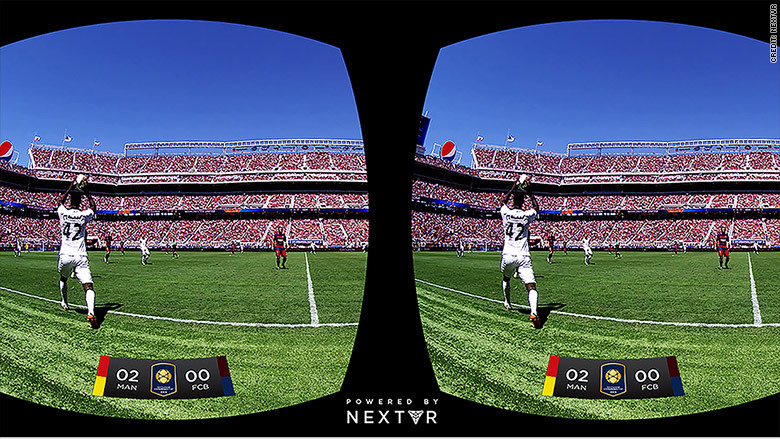 The first live-VR broadcast of a major soccer tournament took place on Saturday. Manchester United played FC Barcelona in the International Champions Cup match. Tens of thousands of people cheered the teams on at Levi's stadium in Santa Clara, California, where it was sunny and 75. My friends and I watched through a pair of Samsung Gear VR headsets in a humid New York City apartment. For two hours, the three of us took turns adjusting the straps around our ears and our hair, simultaneously excited and annoyed by the whole thing. It was a more interesting way to watch soccer for a sometimes-fan like me, but an isolating experience for my football-loving friends who enjoy watching sports in groups. The game was live-streamed in high-frame rate (60 frames per second) from five Red Digital 6K cameras. Both Gear VR headsets were paired with a Samsung Galaxy Note 4. Next VR, the software company responsible for compressing and transmitting the video feeds on Saturday, has tested many other sporting events in the past, including NBA and NHL games, NASCAR races, and the U.S. Open. The live stream was only lightly produced, making me almost feel as if I were at the event. There was no sweeping sports music, dramatic athlete animations or interviews, or ads. There were replays and magnified views of the field during key moments. From my view "in the stands," people took selfies at their seats and struggled with their drinks and food on the stairs. The knowledge that I was actually strapped into a machine was a little too easy to forget after a few minutes. There were numerous issues with the video and audio streams during the game. Sometimes the audio would cut out, and sometimes the screen would go dark. Many times the entire thing froze because the phones got too hot. The problem? Next VR told me it was my Wi-Fi connection struggling to process the incredible amount of data necessary to stream to two headsets at the same time. But even after I turned off one of the headsets, the choppy feeds continued. My situation was an "outlier" among the "roughly 100 folks watching remotely," the company told me. Having to turn off the phones and wait until they cooled down, I probably watched less than half an hour of the approximately two-hour broadcast in total. The picture quality also could have been better. It wasn't high definition, and the views weren't 360-degrees. Both features are coming in the future. Streaming a VR-feed of a live sports game is challenging, and -- when I could get the video to play -- this was a good start. But before companies can expect to charge for something like this, producers will have to make sure the video and audio streams are seamless. And though it was nice being in two places at once, it would've been better if it felt like my friends were with me in VR -- especially since they were sitting next to me in real life, watching the same thing. Otherwise, it was a fun test and great way to watch the game without the overpriced snacks, stadium traffic, and getting sunburned.